Love the mist in the background of these two fine barns. Thanks for sharing at RT this week Michelle. 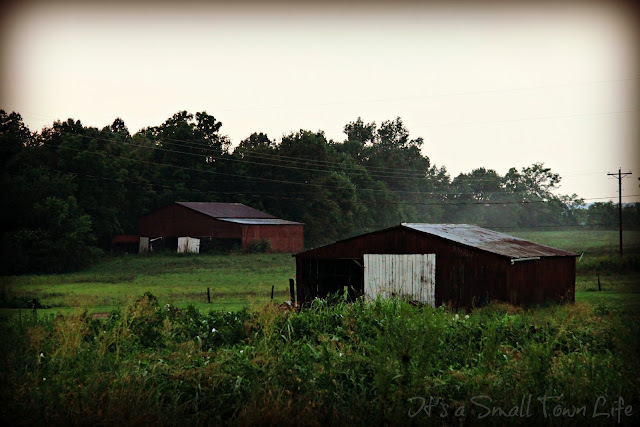 With the mist and the barns, it reminds me of the land around here. Very nice find for Rural Thursday! I'm a sucker for red barns. :) They're disappearing from the countryside up here, so you're wise to photograph them while they're there. I took an unintentional break from blogging this summer. I just was too busy to sit down and put a post together. Until this morning. Actually it was a labor of love that took me a couple of days but I hope to blog more regularly again now. We'll see! they look way bigger than my house!! Beautiful!! I miss the bees though.. how are they doing? Cool red barns in the mist- nice shot! Morning mist is a rising in the country. I would really like some more room of any kind, but I live in a small apartment.